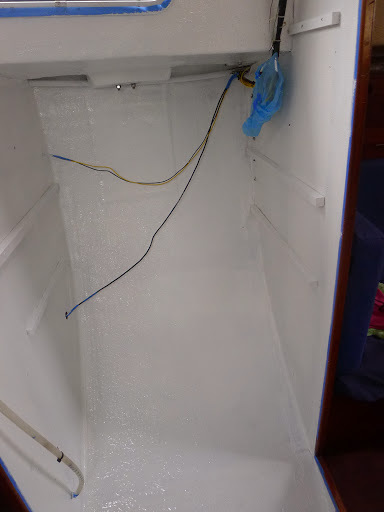 After the successful painting project in the V-berth area, we decided to continue with the “closet”. First of all we moved all our cloths and other stuff stored in the previous head area on the V-berth, disassembled the closet shelves and unscrewed all the other components like handrails, fire extinguisher etc. Sounds easy enough, but only this part took me the whole afternoon. 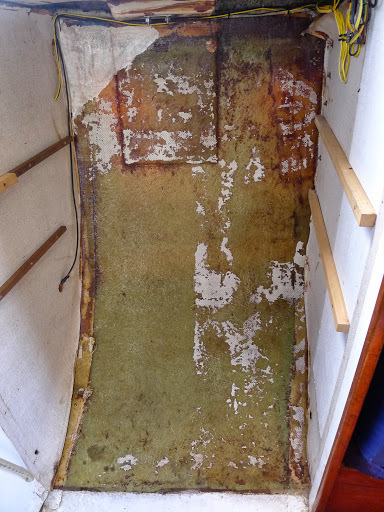 It’s been some time since we noticed that one of the tabbings (fiberglass joints) that bond the fiberglass hull with the wooden bulkheads came unstuck. Since we were about to paint the whole area, we decided now was the right time to repair it. Of course, once we removed all the stuff from the closet, we found out that out of the four tabbings in the closet, we had to replace not one but three of them! So once again out went the chisel and hammer, the old tabbings were removed, everything sanded and just before glassing in the new tabbings, we smoothed the sharp edges by making a fillet with epoxy filler. Once the retabbing was done – we used six layers of fiberglass cloth for each tabbing and ended up using almost one liter of epoxy glue – I glued back the wallpaper on the bulkheads that came unstuck or was removed because of the repairs and then I covered the rest of the furniture and wooden bits, wires, portlights etc. with masking tape. After five days of work we were finally ready for painting. Now we must wait till the paint is hard enough so that we can put everything back together. What a contrast! The above photo is actually a tiny part of the already painted ceiling in the closet and still unpainted one in the main saloon. Can’t wait to paint the rest of the boat! Now i change my mind, i prefer to choose the closet for a nap!